Five years ago, I found myself in the place no pet owner wants to be – the veterinarian’s office watching our beloved pet be put to sleep. Kes, our dog of nine years, had developed cancer that was rapidly spreading through her body. She had quit eating and by the look on her face was beginning to experience pain. Although sad, we had no regrets about ending her life in that way. It was simply the best alternative and most humane thing to do for her. After about a year, we began to experience empty dog syndrome. Having always been dog people, my wife and I were intent on having an animal around the house. So we started the search to make a pet purchase – buying a new dog. Not long into our quest we found him. A beautiful, all black, lab mix named Axel. He was part of a litter of puppies that was up for adoption. We made an arrangement with the foster parent to meet him and assess whether or not he would be a good fit. Upon arrival, we were not disappointed. In every way, Axel lived up to the description we had been given. So cute, cuddly and playful…he was an instant hit with our kids. What we didn’t anticipate though was our emotional reaction when we saw his twin sister Alley. That emotion led to a decision we are now regretting. 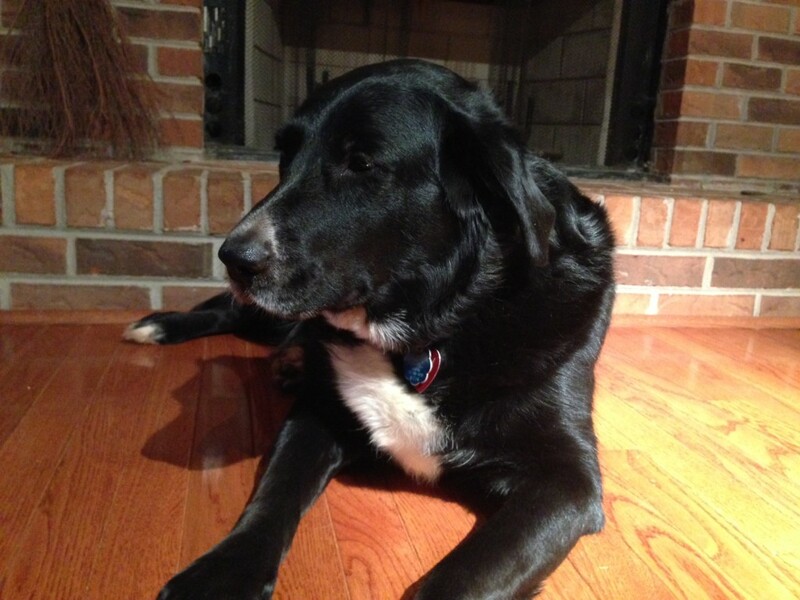 Alley also was a black lab mix, but smaller in overall body size and with a pointier nose than Axel. But one distinguishing feature jumped out to my wife and I when we saw her. She had white fur on her chest and several of her paws…just like our dearly departed Kes. The whole time we were looking at Axel, he was playing with Alley. They chased each other around the yard, tumbled over one another and snuggled in the corner. They were so cute as only puppies can be. First of all, there was the cost factor to consider…double the vet bills, double the food bill, double the puppy sitting expenses when you go on vacation. Secondly, the time factor involved with raising two dogs…double the individual attention, double the number of walks, double the baths. Finally, she said that if we didn’t spend enough time with them there was the possibility the dogs would bond to each other instead of us. We politely listened and nodded our consent. We didn’t care about any of that. Caught in the emotion of puppy love (and the memory of our prior dog), we took them both home. They were four months old. They are now three+ and everything has unfolded exactly as the foster parent described. When we purchased Axel and Alley, we did not take into consideration how life would change in the future. Our lives are moving at a much faster pace now, especially with my wife’s career as a CPA and my oldest daughter who is swiftly moving through middle school. School, careers, home responsibilities, kid activities and other commitments are the main focus of our life, as they should be. With that said, we do not have the time and cannot adequately handle pet owner responsibilities for two dogs. So we have made the difficult decision to put Alley up for adoption. I could spend another 500 words defending this decision. I’m sure many will think us to be heartless pet owners for bailing out and separating these dogs who have been together since birth. But we can’t continue with the present situation and give both dogs the type of life they deserve. So we’ve decided to part with one in the hopes that both of their lives will improve. 1. Have a plan for spending ahead of time. 2. Don’t let emotions influence your plans. 4. Consider all the costs involved, not simply the purchase price. As dog lovers, we feel like failures. It’s been incredibly hard reaching this decision. We recognize, however, that continuing to do the same thing over and over again while expecting a different result is the definition of insanity. Something has to change for both our and the dog’s situation to improve. If you are considering a purchase today, don’t let emotion get the best of you. A decision based solely on emotion will more than likely bring regret at some point in the future. Questions: Have you ever made an emotional pet purchase or other kind of emotional purchase that you regretted later? Have you been forced to give up something material because you knew it was becoming a burden and negatively impacting your life? Have you ever expected different results while maintaining that you didn’t have to change your behavior? I really needed to read this article. I recently lost my pet rabbit and when I saw this adorable cat at the pet store, I wanted to adopt him. He is a rescue cat. The owners took him to the humane society because they were moving. This made me angry-that poor cat to be just dropped off. Couldn’t a family member take him until they could find him a good home? I have cats already and there is a delicate balance between them (cats can be territorial) and my husband said that if I brought another cat into the home, it was stress out the other cats. It wouldn’t be fair to our cats and it wouldn’t be fair to the cat I wanted to adopt. So I prayed for someone to adopt him, someone who would be able to give him a good home. Could you pray too? Could you pray that the cat named Gentle Ben (God will know who he is) gets adopted by a good family? Thank you. Emily. Oh my goodness, I hope that’s a decision we never have to make. I think it would break my heart. I think if we had to, my husband’s parents would take them. But, you’re not a failure. Situations change. You’re not just dumping the dog on the street – you’ve found her a loving home. That’s the best ending. “…you’ve found her a loving home.” We did and it’s turned out great…not only for her but for us. She has a great new owner and we have a new-found relationship with our current dog. He’s a different pet with her not around…very attached to us which is cool. Also much more calm and loving. Ugg, that’s a decision I hope I’ll have never have to make. We have a dog and two cats and I’d adopt a whole shelter’s worth if I had the space and money. I hope you’re able to find Alley a good home. Want ours? 🙂 You sound like the type of person I’d love to run across right now. That’s a really tough decision, but it doesn’t make any sense to compound one emotional decision with another one. It sounds like you guys have recognized your mistake and are doing what you think is best to make it better. I hope it all works out. Thanks Matt…I think it will. We won’t be abandoning her or giving her over to just anyone. Even though the dogs will be separated, I believe their quality of life will improve. I have been wanting a cat for some time now and the situation you’ve described is one of my biggest fears. We’ve never had a cat before and I am terrified of it not working out and having to put the cat up for adoption. Regardless, you adopted the dog out of live and did the right thing. I hope that you find her a good home! I think it’s like any risk you might take into the unknown. Nothing ventured, nothing gained. At least there are humane options like adoption that you can take advantage of if it didn’t work out. It’s not like you will have to abandon the animal by dropping them off in the woods somewhere (which is how we came across our first dog Kes). That’s being cruel. I don’t think our house was an “emotional” decision by any means, but it definitely has taken a lot of time and effort to maintain and update it, especially since we typically go the DIY route. We are both VERY busy people as 20-somethings who just started their careers, so I would say at times it’s a burden. We had to put down our 20-plus year-old cat a couple weeks ago and while it’s really hard to think ahead right now I know that we have been, for a while now, considering adding a dog to our ‘family.’ What worries me is the time commitment of caring for a dog properly. I think we’re ready for it, but at the same time I know it’s another thing added to our lives that will take a lot of time and money. They do take time and money and, as we’ve learned the hard way, you really have to be committed to it. I’d tread lightly if there is any hesitation whatsoever. Sometimes as a non-pet lover (like animals, just not a big pet person) I have a hard time relating to these types of stories, however I always appreciate a person willing to put the animals needs before their own when they recognize what they can and can’t afford. It breaks my heart to see people struggling to pay their own bills buy an animal just because it means that animal will suffer a bit due to the person feeling they can’t live without them. It’s wise, albeit sad, to come to this conclusion. Sorry for your sadness over losing a pet and for your kids who I’m sure will take it the hardest. Best of luck finding a good adopting family! Thanks for the sentiments. We know in the long run this will be best for Alley, even though it’s challenging for us in the moment (and might be for them once they are separated). My wife had two cats when we were dating that she had raised from kittens. She thought the two would keep each other company while she was working. After the cats grew, they certainly kept each other company, but wrecked the house with their carousing. My wife put the cats up for adoption after it turned out that our son was allergic to them. So sorry to hear about your very tough decision. We recently lost our beloved English Bulldog, Lily, so this hits home so much! I think the important thing about this decision is to know deep down that you are making the right decision for you and your family. I’m sure you will take the time to find Alley the best home possible. I’ve been guilty of making emotional financial decisions many times in the past. My husband does a great job of reigning it all in and helping me make sense of it all. As an emotionally-driven person, I’ve found that if I actually write down my problem and make a pro’s and con’s list, I become much more analytical and can make more rational decision based on my evaluation. Big hugs to your family! We all know it’s the right move and will feel better with it in time. I like your idea of the pro’s/con’s list. That’s a great way to filter through the emotions and make a better decision. This is such a tough story, Brian. No one likes having to give up a pet, but I think the important thing here is that you’re doing what’s best for Alley, since you’ve found you can’t give her the care she requires. I think you might want to take some steps to try to ease Axel and Alley apart, though, before she’s adopted. A sudden, unexpected separation could stress both dogs, and I don’t think that’s something anyone wants. That’s good advice Adam. I think they are getting some of that now. Every Saturday and Sunday they are separated for four hours as Alley goes to the adoption program at PetSmart. We’ve also seen signs they are separating more from one another at home. Alley will want to be inside while Axel stays outside. Let me assure you this does not make you a failure at all. I’ve seen so many people simply abandon their dogs on the street, tie them up in front of our shelter for us to find in the morning, or put them down because they didn’t want the responsibility anymore. You’re taking the best course of action you can. As someone who sees litters of puppies and kittens come into the shelter, they are seriously hard to resist. You want to take them all. When we had to put my cat down back in Sept 2012, I wanted desperately to fill that void, even though I had another cat at home! I waited until last year to get a kitten, but even so, I tried to justify it as my cat needing a playmate. I see many people come looking to adopt after only a week of being without their beloved pet. It’s difficult to go through. “…desperately to fill that void…” It’s similar to catching another boy/girlfriend on the rebound after being dumped. You feel lost without a companion. What a tough decision to make but it sounds like one that you thought long and hard about before making. We’ve all been guilty of making emotional purchases and animals really tug at our heart strings. I can easily see how Alley would have appealed to you, but you’re making the best choice for her to find a home where she can get all the attention she deserves and needs. Why is it that pet decisions are so emotional…more so than most other purchases? I find that very interesting. Sorry to hear that Brian. My wife and I are dog lovers as well and we ended up having to give the two dogs my wife came in to the marriage with away when we found out about our son Isaac. We had no idea what kind of care he’d require, or the expense and they were one of the things we decided to give up. Thankfully we were able to get my in-laws take them which was huge. That’s the best scenario…when you can give them to people you already know. We’ve not had any luck with that yet, so we are additionally working with the Humane Society and their adoption program through PetSmart. I’m sure you both weighed the decision very heavily Brian. That’s a really tough one to make. I gave up the kitten I had for six month that I got in Detroit when I decided to move to Seattle. Luckily I did find him a good home and I think/hope he lived a happy life from there. It’s tough to predict what our life will be like 2, 3, 10 years from now. I love my dear sweet cat Pepe, but when he passes I will have to give some SERIOUS thought to getting another pet. It’s not so much the cost but more the fact that I don’t feel settled right now, and I want to make sure I’m making things easy on me to be able to pick up and move if I need to and not have to add that as a filter when I look for apartments. And when I got him I had a full time job, and now I don’t, so there is that to consider too. I hope you find a good home for Alley! Thanks for the good wishes Tonya! Circumstances do change, which is part of what we were not anticipating. The full-time jobs/pet owner thing is really tough. Enjoyed reading your story – which I can definitely relate to – and the parallel you drew to making financial decisions. Like many people, most of my emotional buying decisions in the past have revolved around purchasing new products (e.g. TVs, cell phones, etc.) as soon as they come out. Fortunately, I am mostly reformed. As an example, the wife and I have both have had our current cell phones for over two years and really have no desire – not really even thinking about – spending money on new phones. These work just fine. Similarly, we both paid off our cars 1.5 years ago and a new car(s) are not even on the radar. The thought of taking on a new car payment gives me chills. In a bad way! It’s so easy to let the emotion of the moment override any logic or reason. In hindsight, we should have stuck to our original plan. Keep listening to those chills…that’s a great sign that you shouldn’t go there (buying another car). Thanks for the comment.